Founded in 1996, the International Defensive Pistol Association is a relative newcomer to the action pistol sports, but IDPA matches are popular all over the countryâ€”in part due to the explosion of the number of states who have legalized concealed carry. IDPA is all about practicality. 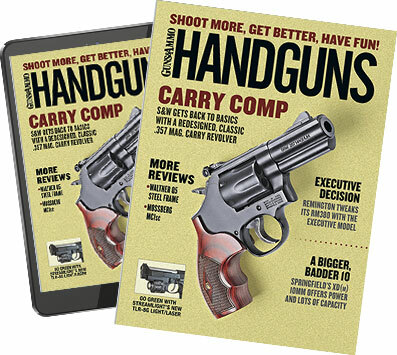 Competitors use handguns and holsters truly suitable for self-defenseâ€”no "competition only" equipment. Courses of fire, which are limited to 18 rounds each, are designed to simulate self-defense scenarios and real-life encounters. IDPA's website has a lot of info for beginners, including the complete rulebook and the ability to search for local clubs that host matches, along with contact information. While everyone competes together, shooters are segregated in scoring by the kind of gun they use and what class they're in. Clubs hold a 90-round classifying match once a year, although you don't have to be classed before you can attend a local match. Classes are Novice, Marksman, Sharpshooter, Expert and Master. As IDPA competition is designed to help shooters practice real-world skills there are penalties for doing things you wouldn't want to do in an actual gunfight. Where "cover" (whether it's a wall or barrel or something else) is available, it must be used by the shooter both when shooting and reloading. Any magazines left on the ground with rounds in them will get you a penalty, and shooters either need to retain their partially spent magazines or shoot until slide lock before reloading. The majority of targets at IDPA matches are cardboard silhouettes with perforated scoring rings. Targets are deemed either Threat or Non-Threat targets. Non-threat targets will have open hands painted on them, and accidentally hitting one of them will cost you. Threat targets have to be engaged with a specific number of rounds that may be different for each course of fire, and any steel targets must be knocked down to score. Insufficient hits in the right places will give you a "Failure to Neutralize" penalty. Misses will cost you five seconds, and procedural errors (dropping a magazine with rounds in it, not properly using cover, etc) will cost you three seconds. You may hear competitors using the phrases "tactical sequence" and "tactical priority." These are not the same thing. IDPA philosophy requires that all competitors engage their targets using tactical priority: Shoot what targets are visible from behind cover before moving on, without exposing yourself to targets that haven't been shot yet. Tactical sequence is a method of target engagement where multiple targets are visible from one spot. Every target has to be engaged with one round each before the shooter can go back and shoot them again for the total specified minimum number of hits. Any conscious attempt to compromise the spirit of the game by using inappropriate equipment, devices, or techniques will get you a 20-second "Failure to do Right" penaltyâ€”IDPA'S version of an unsportsmanlike conduct call. Your score is simply your time, plus any penalties for procedural errors or added points for shots not in the center scoring ring of the target. Like in golf, the lowest score wins. This scoring system is more weighted toward accuracy than speed. There are five pistol divisions: Stock Service Revolver (rimmed cartridges only); Enhanced Service Revolver (rimmed or rimless in moon clips); Stock Service Pistol (DA/SA or DAO autos), Custom Defensive Pistol (single-action .45 autos); and Enhanced Defensive Pistol (single action semiautos in 9mm or larger). ESP and SSP guns are limited to 10 rounds in the magazine to level the playing field; no extended magazines are allowed in any division. IDPA competitors have to wear a covering garment to conceal their pistol/holster and spare magazines/speedloaders when competing to simulate real life. While the multi-pocketed tactical vest has become the stereotypical IDPA cover garment, you'll see everything from Hawaiian shirts to baseball jerseys worn at matches. IDPA has rather strict criteria about which types of guns and gear are allowed. Holsters need to be at belt level, fully cover the trigger guard and be suitable for continuous wear. Both holster and spare magazines need to be positioned behind the centerline of the body, which originates in the center of the armpit and goes straight down. When in doubt, check the rulebook, which you can find at IDPA's website. "Load and Make Ready." Load your pistol and place it in your holster. "Shooter Ready." No response required. If you're ready, just wait for the beep. If you hear "Finger," during the course of fire, make sure you're keeping your finger out of the trigger guard while moving or reloading. If you hear "Muzzle," you need to make sure your pistol is pointed downrange. If the safety officer yells "Cover", you're not far enough behind it. When done, follow the commands, "Unload and show clear," and then "Slide forward, hammer down, holster."